There is no need to cite further examples, when it is more elegant to put this in the form of a general rule, which can be stated as follows: Whenever a public person, whether in politics or in the media, introduces a statement with a phrase using the word fact ( as in "The fact is," "The fact of the matter is," or "Face or accept the fact that"), the statement that follows will very likely be an entirely subjective opinion. More simply put, Fact = Fancy. After far too many hours trolling (in the good sense) the web, I am about Poped out. It occurs to me that the new Holy Father is who he is and is going to do what he's going to do whether I can predict it or not. And he's unlikely to ask my opinion in any event. So I decided to look for a good version of the reel JB Milne that shows the first couple's turn and cast on bars 9-12. I found one, but this wasn't it; on this one you can't really see clearly how anyone's doing the pas de basque turn. But I liked the music and the general energy and enjoyment going on. Don't know who the band is but they seem to be enjoying themselves, too. There's one more SCD video that must needs appear on The Inn but I've got to locate it again. In the meantime, some nice border piping by a lassie named Shonagh Duncan playing Steal Away, Kalabakan, and Sleepy Maggie. My own border pipes arrived a few weeks ago, but in between miserable health and Santa Ana winds (it dries out the air and bellows-blown pipe reeds don't get enough moisture to tune properly) I haven't had much chance to get very proficient with them. This lady on the other hand. . . . He quotes an article which appeared at the time in an Argentine publication. You can find it here. It is, alas for us anglophones, solamente in Español but pretty easy to work out the gist of it (especially for us Californians, who should be used to figuring out simple Spanish by now). Chronicles -- from an Orthodox writer. Rorate Cæli -- not optimistic at all. There are a few posts; you can scroll down. The one from the journalist from Buenos Aires we can only hope is. . .exaggerated. LifeSiteNews -- optimistic, and then some. National Catholic Reporter -- a John Allen essay on Cardinal Bergoglio written before the conclave. Just received an extensive letter from Robert Moynihan full of information on the new pope. As of this writing it isn't up on his website yet but it should be shortly. Check here. faciat eum in terra, et non tradat eum in animam inimicorum eius. upon earth; and may he not be delivered up to the will of his enemies. He is Msgr Jeffrey Steenson of the Ordinariate of the Chair of St Peter. Our little parish of Blessed John Henry Newman is part of the Ordinariate and owes its canonical allegiance to Msgr Steenson. She hates too much praise. . . .
. . . so for the most part I just link without comment. But sometimes you have to risk it. I've been following the papal retirement story as much as I can bear to. The secular press is, well, wrong. To put a kindly word on it. The Catholic commentary contains a tremendous amount of pious drivel. (No, I won't cite you to any. It may be twaddle, but so far as I can tell, harmless twaddle.) Some commentary is just bizarre. Some quite good. Robert Moynihan's series of reflections have been informative and balanced. But Hilary White's piece in LifeSiteNews pierces the heart. This is a beautiful piece of writing you shouldn't miss. Do click on the link. It's quite moving. She puts you in the square at Castelgandolfo on the day itself. 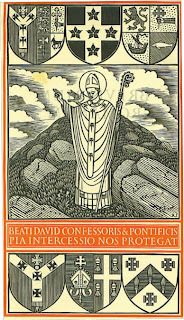 The feast of St David, bishop and confessor, the national patron of Wales . . . was yesterday. Oh, dear. Mea culpa. I had my citations ready and then on the day got distracted. 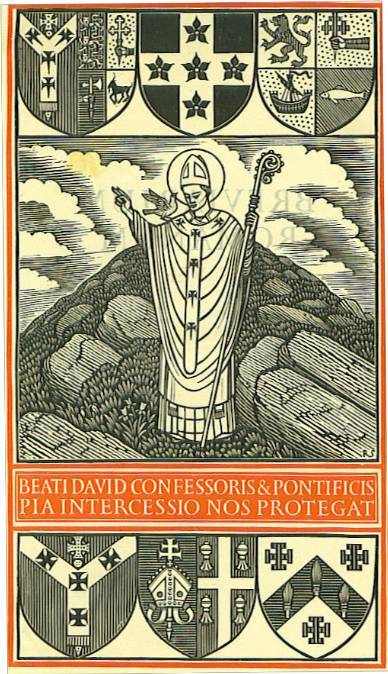 But it's not too late for a bowl of potato leek soup or to pray a collect in honour of St David. Almighty God, who dist call Thy servant David to be a faithful and wise steward of Thy mysteries for the people of Wales: in Thy mercy, grant that, following his purity of life and zeal for the gospel of Christ, and assisted by his prayers, we may with him receive the crown of everlasting life; through Jesus Christ our Lord, to Whom with Thee and the Holy Ghost be all honour and glory, world without end. Amen. More about St David here and here.